Python is one of the most popular general-purpose programming languages used for data analysis and visualization. Scripting languages have taken over from object-oriented languages as flavor of the decade, mostly because of the power and flexibility they provide for developing graphical user interfaces. Scripting languages are the basis of technologies on the World Wide Web, and office software suites such as Microsoft Office rely heavily on them. The earlier scripting languages were simpler and were generally built on top of the languages that supported system programming. Python is a full-fledge programming language which makes experimentation easy. Solutions to problems are simply and elegantly expressed. And the best part, Python makes programming fun. SQL is a query language designed to query and extract data from databases. A database is nothing more than a set of related information. A telephone directory, for example, is a database of names, phone numbers, and addresses of all people living in a specific region. Database management systems have been around for years. With today’s technology, the accepted use of database management systems have began to flow in other directions, driven by the growing demand of businesses, increased volumes of corporate data, and Internet technologies. SQL is a standard language used to communicate with a relational database. Python is a scripting language written in portable ANSI C, so it compiles and runs on all viable operating systems. It was derived from ABC, a language designed to teach programming in the early 1980s. Traditional system languages such as C++ and Java were designed to solve problems that arise in large-scale programming, where the focus is on structure and discipline. Python suggested an alternate approach to programming. Python is flexible with a number of features that make it a preferred choice as a first programming language. And the best part, Python code can be written using any plain text editor that can load and save text using either the ASCII or the UTF-8 Unicode character encoding. Python implements all the concepts usually associated with object-oriented programming (OOP). In 1970, Dr. E. F. Codd of IBM’s research laboratory published a paper entitled “A Relational Model of Data for Large Shared Data Banks” that suggested data be represented as sets of tables. Shortly after the paper was released, IBM created a group to build a prototype based on Codd’s ideas. This group developed a simplified version of a language called DSL/Alpha which was originally proposed by Codd and named it SQUARE. They further refined the language and named it SEQUEL, which was finally, renamed SQL. Tables are the basic unit of data management in an SQL environment, which provides the structure in which SQL is implemented. SQL is the language you use to express your needs to the database. – Python is a widely recognized scripting language written in portable ANSI C. Python is a high-level general-purpose programming language used for developing desktop GUI applications, websites, and web applications. Python is flexible with a number of features that make it a preferred choice as a first programming language. SQL (Structured Query Language), on the other hand, is a query language that allows you to access and manipulate databases. SQL is a standard language used to communicate with a relational database. It is the language you use to express your needs to the database. – Python was derived from ABC, a language designed to teach programming in the early 1980s. Python was created by Guido Van Rossum at CWI in the Netherlands and the development began in the late 1980s. It was mainly developed for emphasis on code readability. The name “Python” came from the famous British TV comedy series of the 1970s “Monty Python’s Flying Circus”, which Rossum was watching at about the same time he needed a short name for the language. SQL was initially developed by IBM but the idea was based on Dr. E.F. Codd’s paper entitled “A Relational Model of Data for Large Shared Data Banks”. – Python is a general-purpose programming language used for developing desktop as well as web applications. It is a simple, easy-to-learn programming language known for its readability, simplicity, and portability. With the right tools and libraries, Python can be used to build almost anything. Ideally, it is used for backend web development, data analysis, scientific computing, and artificial intelligence. 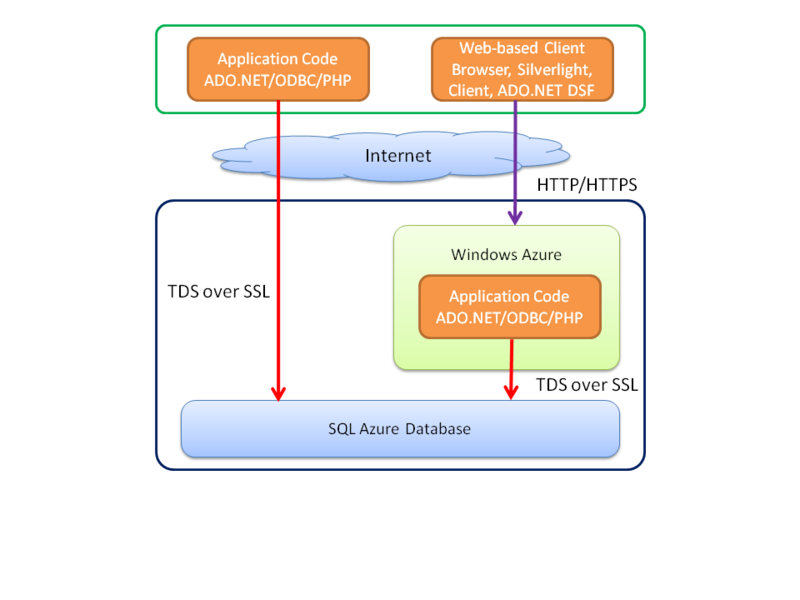 SQL is the standard query language for relational database management systems. It provides a structured way to get information out of relational database systems for use in corporate applications. Python is a full-fledge programming language which makes experimentation easy, whereas SQL is the standard query language for relational database management systems that allows you to access and manipulate databases. Python is a general-purpose programming language used for developing desktop as well as web applications. It is a simple, easy-to-learn programming language known for its readability, simplicity, and portability. SQL is the language you use to express your needs to the database. Over time, new features have been added to the SQL language to incorporate object-oriented functionality. It is a powerful data manipulation language based on relational ideas. Sagar Khillar. "Difference Between Python and SQL." DifferenceBetween.net. 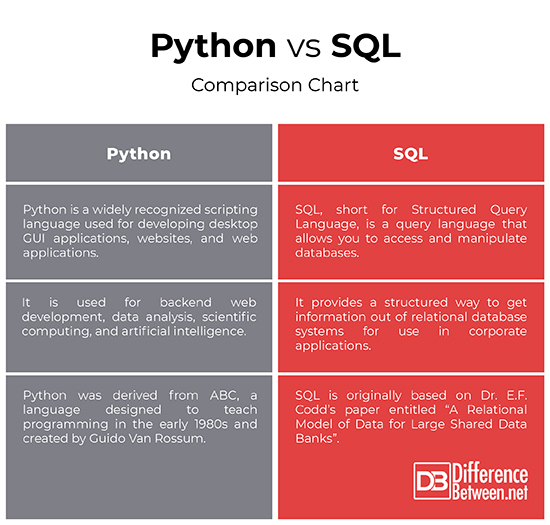 March 14, 2019 < http://www.differencebetween.net/technology/difference-between-python-and-sql/ >.